"If Bartlet's granddaughter, Annie was 12 six years during the pilot of the series, how can she be starting high school the week before The Birnam Wood" takes place? Tristan Weir email us to point this out. We do not have an explanation. Are we to think she has been held back in school or has she been so sick she couldn't keep up with her grade level or is she and or us in some kind of time warp? Maybe he was so concentrated on getting these people together that Bartlet misspoke and meant to say, "Annie started her last year of high school last week" and he just left out the words "her last year of". 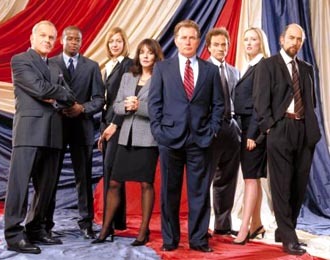 January 20: Bartlet inaugurated and gives First State of the Union shortly thereafter. January 20: Bartlet inaugurated for a second time (#414 & 415) This absolutely has to be year 5 since the second inauguration cannot happen in any other year --- missing Christmas/year must be after this. A Christmas --- the administration's Sixth. Late August/Early September: Peace Talks at Camp David with the Israelis and Palestinians and Leo's heart attack. As "LadyHermes" pointed out on Television Without Pity's West Wing forum, this does mean that Josh would have spent more than two months in Germany with Donna. That is difficult to fit in with what we saw but it is the only thing that would fit other things. In "Impact Winter" it is near Christmas but Leo talks about it still being possible for Josh and his chosen candidate to meet the New Hampshire filing deadline. For the 2004 Presidential Election, the New Hamphire primary was January 27th and the filing deadline was in late November. But these dates change each year and one year may be later than another and sometimes the New Hampshire primary is in February so the deadline would be later. Not usually a full month later but maybe. (above address doesn't reach anyone connected to the show itself).